"I feel really inspired. First of all, it is really well done. It weaves Bob Avakian and the ideology and all that behind it with the performances, with the speakers, with the history... it had me captivated." —Someone active in arts and events. "...you can find inspiration and uplift in this [film], and possibly come away with a whole different mindset if you open yourself up to it. For me, it really did inspire me and gave me a little bit of hope that what I'm doing artistically, while not commercial, is on the right track. It's uplifting, and uplifting that there is room for me in this type of revolution." "I'm excited for the screening in December because [the film is] very diverse... I think it'll touch base with a lot of issues and bring forward the problem and solution... The most important thing I got from watching this film is that change needs to come. I would recommend it to others because it will show them what they need to see, it will give them the truth and won't hide or sugarcoat it. This is the truth, now you do what you think is right... people will change, will react to it." 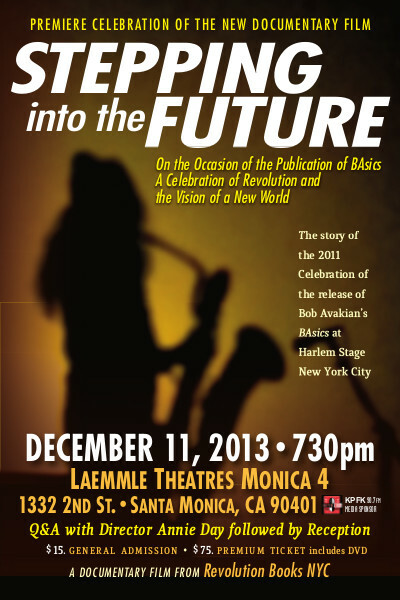 These are just some of the comments from a diverse range of people after watching the documentary film Stepping into the Future—On the Occasion of the Publication of BAsics: A Celebration of Revolution and the Vision of a New World, which will be screened in release celebrations on Saturday, December 7, in New York City and Wednesday, December 11, in Los Angeles. BA Everywhere— Imagine the Difference it Could Make! Stepping into the Future takes off from an event on April 11, 2011, where hundreds of people joined in a thrilling taste of revolutionary possibility at Harlem Stage in NYC. BAsics, from the talks and writings of Bob Avakian—the handbook for revolution in the 21st century—had just been published (and today is in its second printing and as a free e-book). To mark the occasion, musicians, dancers, poets, actors, visual artists came together with revolutionaries and activists from the 1960s down to today for a cultural event titled "On the Occasion of the Publication of BAsics: A Celebration of Revolution and the Vision of a New World." Harlem Stage soared with revolutionary joy as hundreds of people, young and old, of different backgrounds and diverse political viewpoints, were taken on a journey: lifted off their feet and touched to their cores as they traveled through the night of jazz, funk, soul, rock, poetry, dance, theatrical readings, and visual arts all woven together with deep revolutionary insight from archival film of Bob Avakian, readings from his BAsics, and commentary from voices who have been on the front lines for decades. As Revolution newspaper wrote at that time: "All of it aching for, giving voice to, and infused with the possibility of a radically different world than the maddening planet we live on now." 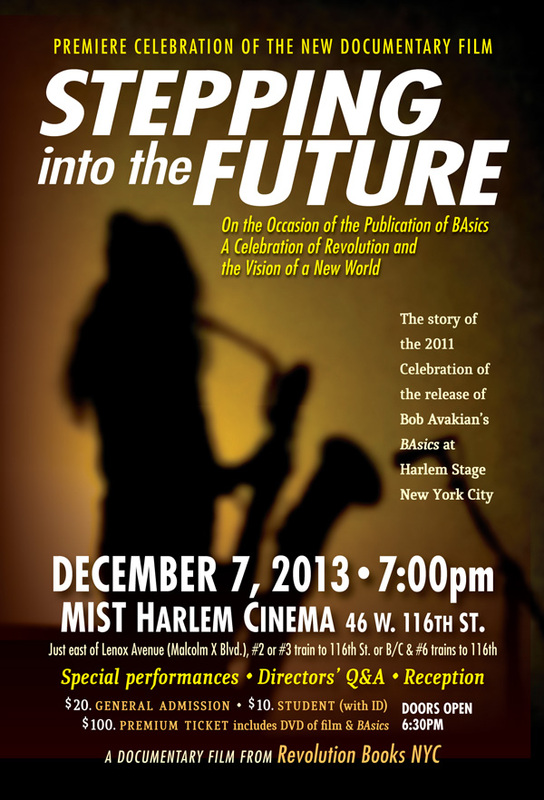 The New York celebration and screening of the film Stepping Into the Future will include special performances by Matthew Shipp, William Parker, and Abiodun Oyewole; directors' Q&A with Annie Day and Andy Zee; and a reception. This film is the story of that night—the reflections of the artists and participants—what inspired them, their hopes and dreams. In one hour and 15 minutes, you feel and understand the depth of transformation that can take place when the revolutionary vision and framework developed by Bob Avakian, which is concentrated in BAsics, sets the stage—here for an evening—yet foreshadowing the potential for a whole new world. 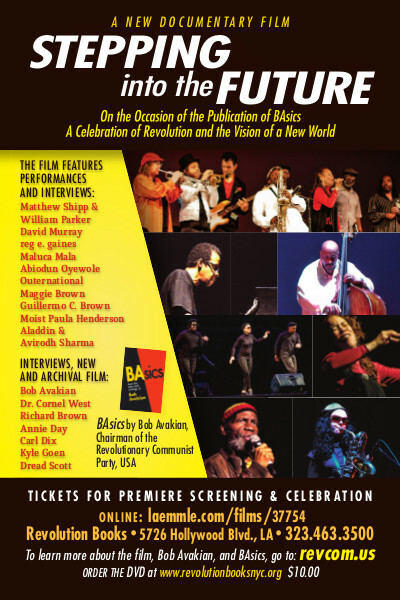 The film features tastes of the performances at Harlem Stage, and the urgency, uplift, humor, and beauty of the night comes through a compelling narrative of the deep concerns of the artists and presenters about the horrific state of today's world, the lies and the crimes of America, the importance they see in revolution and in BA's voice being known throughout society—why that matters and their hopes for what this could mean for the future of humanity. In the initial smaller screenings, people have been deeply impacted by this film. For people who have never seen or experienced Bob Avakian and the impact of his words, this film is an inspiring introduction. 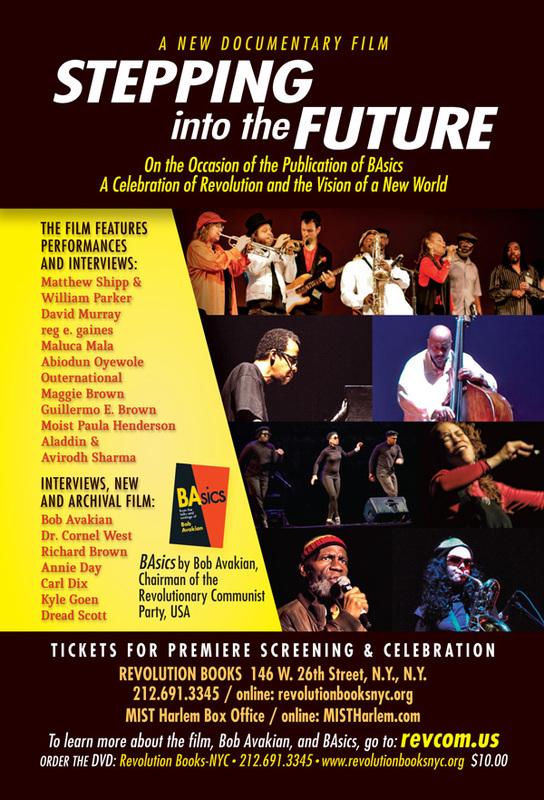 In the documentary, jazz composer and musician Matthew Shipp comments: "Avakian talks a lot about revolutionaries having a poetic imagination, so it was really good to see that idea within the context of an event that has to do with the political or philosophical idealism of revolution." A number of people have commented about getting to see BA develop over the years, learning how long he's been committed to revolutionary change and how he's persevered in the face of great difficulty. The reggae musician quoted at the beginning said, "[The film] gave me the impression that what is available for revolution is really possible. There's a very scientific method, there's theory, there's also the idea of a very structured plan that's available for those with consciousness and it can open up that consciousness also." A couple of artists commented on how the film makes you recognize the brainwash of this culture and society and impels you to want to find out more about this revolution and BA. Others have said how much this went up in the face of the incorrect conventional wisdom about what communism is and the exciting and liberatory culture people should be striving for today. There have been comments on how moving it is to see this whole range of people who are putting their lives on the line for something so much bigger than themselves. A number of people have talked about how rare it is to see the range of nationalities, viewpoints, and ages... all inspiring and challenging each other... bouncing off of BA, challenging people to get into BA, and working towards real change in their words and in their art. Imagine this multiplied throughout society... reverberating through people's hearts, changing their thinking and lifting their hopes. Imagine people coming together to experience this—the forging of something new up against all the degrading culture and in-it-for-self mentality. And imagine this part of fighting to go somewhere... building a movement for revolution... and as part of the mass campaign to raise major funds to project Bob Avakian and his vision for a radically new society and his works into every corner of society: BA Everywhere... Imagine the Difference It Could Make! Stepping into the Future shows this with life, voice, and diversity. You feel what is possible for all of humanity with the real potential of revolution and a beginning understanding of the new synthesis of communism brought forward by BA... and it gives you a living, heart-beating, and foot-stomping feeling of what can change if BA were really everywhere... a contending pole in society right now up against all the exploitation, mass immiseration, and low dreams of the world as it is. If you liked this article... be part of spreading BA Everywhere. Right now, we are in the middle of a major two-month effort to make a serious leap in this campaign—to raise the kind of serious funds required to truly impact society, making BA a household name. These celebration premieres are coming at the perfect time and should be a tremendous impetus in this drive, raising funds and making known what this is all about, and what can be broken open with BA Everywhere—the inspiration, the intolerance and outrage with the needless suffering today, the debate over what is the source of all the suffering and torment that is plaguing humanity in this system of capitalism-imperialism, and what is the solution: revolution and the new synthesis of communism developed by BA, who is leading a movement to make revolution in today's world. There is great joy in coming together to forge the new—the debate, discussion, and dreaming of what is possible for humanity... and the serious understanding of what we are up against in fighting to bring this into being. This is what BA Everywhere is about... and what should be brought together coming into these December screenings, and brought to a whole new level through reaching throughout society and raising lots of funds through all this. Anyone seriously agonizing about the state of the world should be in the house at the celebration premieres on December 7 and December 11. People should be buying their tickets, spreading the word and getting unleashed themselves in all kinds of ways... to contribute funds to BA Everywhere, to bring their friends to these events, to get out word about these screenings and BA Everywhere on social media and more. There should be a movement of house parties coming off these screenings through the rest of December, mass fundraising efforts of yard sales, candy sales, collecting change jars—or for those with much greater resources, contributions in the thousands and tens of thousands and serious sit-down meetings to discuss this. Along with Stepping into the Future, there should be screenings of BA Speaks: REVOLUTION—Nothing Less! Bob Avakian Live; sales and discussions of the new special issue of Revolution, "You Don't Know What You Think You 'Know' About... The Communist Revolution and the REAL Path to Emancipation: Its History and Our Future," sales of BAsics, BA's memoir, and more. And these screenings should be just the beginning of efforts over the next year to get these films way out in society: small film festivals, cable TV, and more. And there will be an opportunity for people to volunteer to be part of these efforts at these screenings (or by writing to baeverywhere@gmail.com right now). On December 7 and December 11, step into the future... a future people would actually want to be in... a future that really could be. If you like this article, subscribe, donate to and sustain Revolution newspaper.